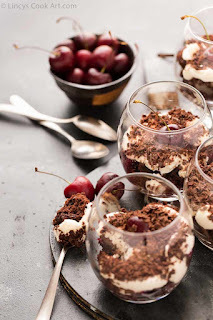 Easy Black Forest Trifle| Chocolate Cherry Trifle is a quick to assemble dessert in minutes. Left over cake crumbs could be utilized in an efficient way. I have prepared the chocolate cake using this recipe. The cake is absolutely soft and moist it soaked with the cherry syrup and tastes real yum. 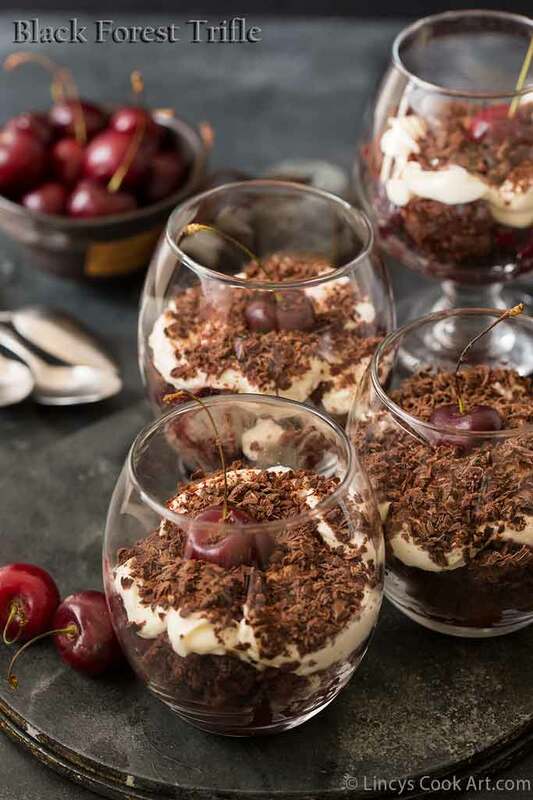 My son loves this cake trifle as he loves chocolate.A wow dessert that can be prepared in advance, only needs to be refrigerated prior to parties or gatherings. 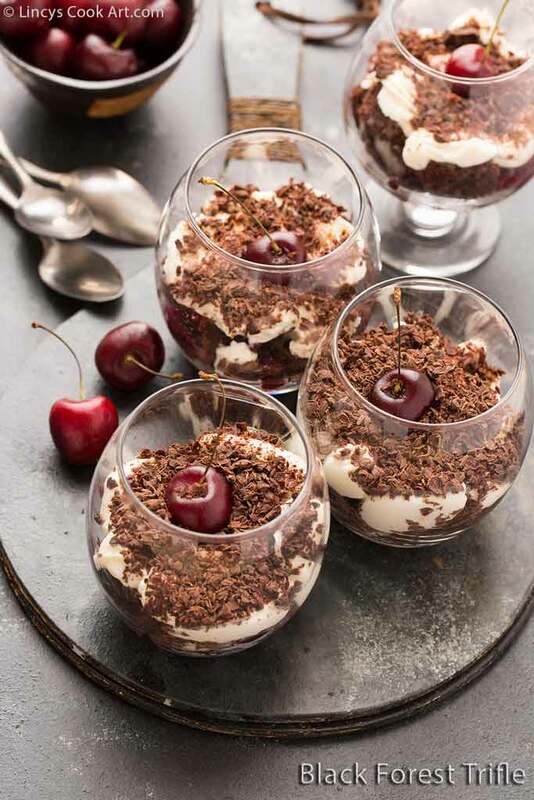 Simple yet delicious appealing dessert. You could buy chocolate or brownies from shop and assemble this dessert too if you feel lazy. 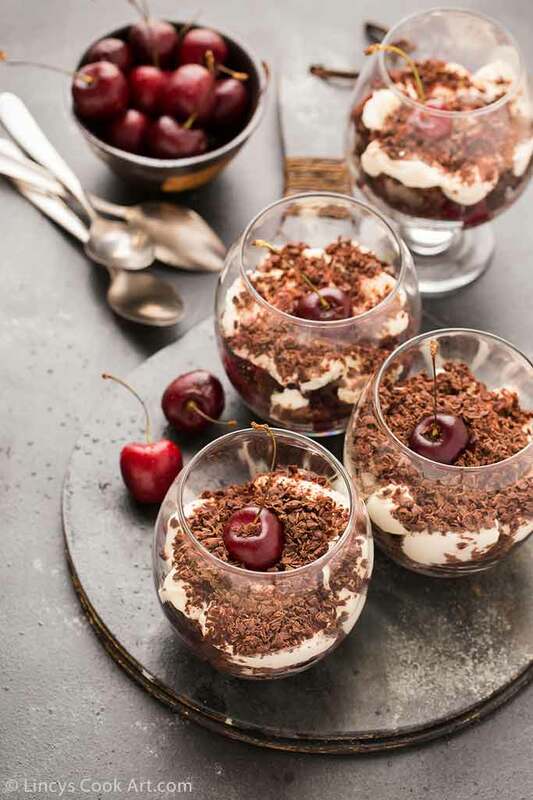 Now cherries are in season and it is delightful to make these with fresh cherry syrup and top it with fresh fruits that taste divine. I love the fruit bits inside this dessert. 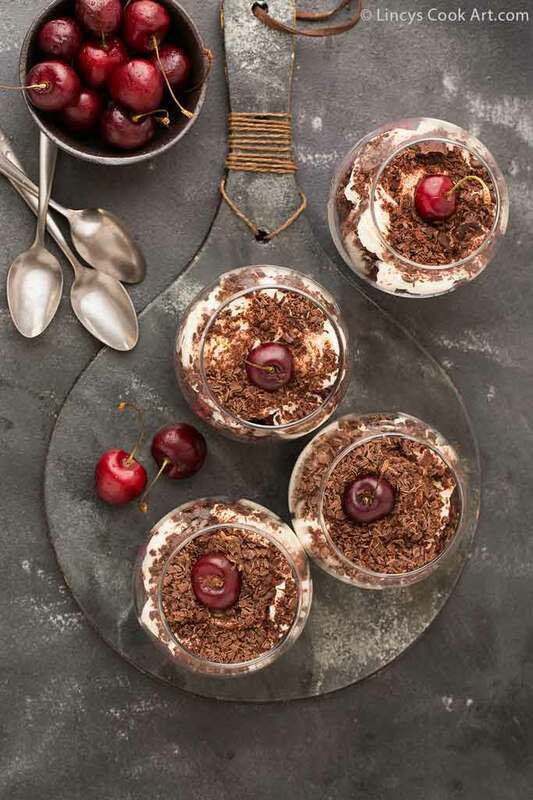 You could use chocolate chips or fruit pieces for extra taste and garnish for this appealing dessert. Chill the whipping cream and whip with 2 teaspoons of sugar and vanilla essence till stiff peaks. Refrigerate till you use. I have prepared the chocolate cake using this recipe. You could follow this healthy beetroot chocolate cake recipe, Chocolate Brownies or make use of the leftover crumbs after icing a chocolate cake. I used cherry compote by boiling chopped fresh cherries 10 nos with two teaspoons of sugar and half a cup of water and allowed to boil for few minutes till the cherries softened; allow to cool. To assemble task a glass tumbler and first divide and fill the crumbs into four glasses. Then drizzle 2 teaspoons of the cherry syrup or the diluted compote over the chocolate cake. Then layer on top with the whipped cream. 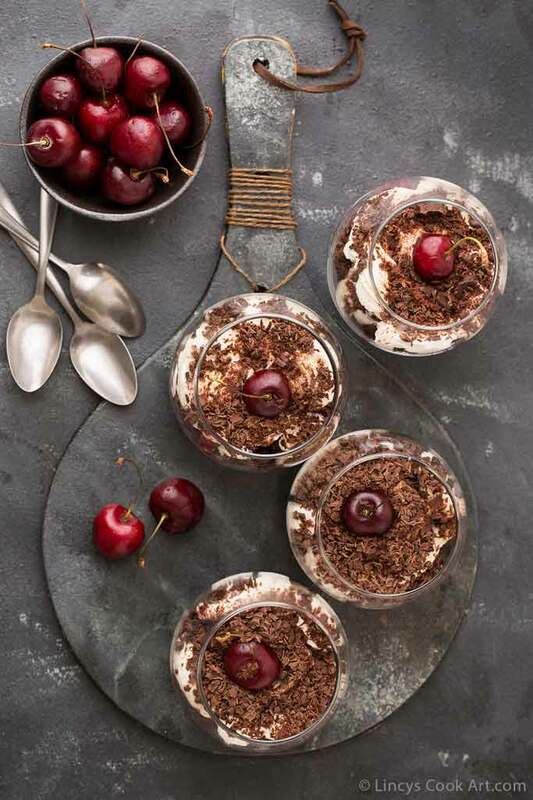 Garnish top of the dessert with chocolate shavings or cocoa powder and top it with some fresh cherries or cherries in syrup. You could layer once more as mentioned above the same way to get two layers. You could assemble everything in one single big deep bowl or trifle glasses. You could use cherry pie filling by slightly diluting it or dilute the prepared compote or jam by adding some water and boiling a bit and use it for the syrup.